The pioneers who came to Tulsa, I.T., at the turn of the century gave much to the City of Tulsa. 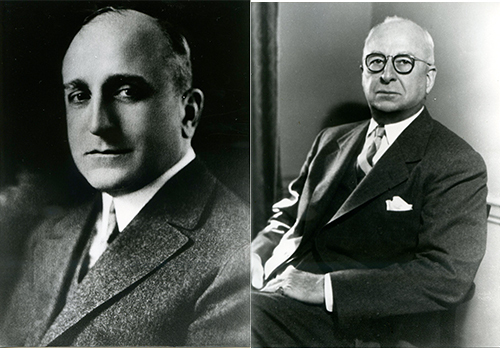 Like other pioneers, Cass A. Mayo and John D. Mayo made their mark in business. But the Mayo brothers did much more than most pioneers. They imprinted the city with their unique style, and, as a result, gave Tulsa its identify. The Mayo brothers, natives of Randolph County, Missouri, joined forces in Tulsa in 1903. Cass came up from Texas, where he had worked in the real estate business. John came directly from the family farm in Missouri. Their first business venture was a furniture store located at Second and Main. The store’s success was due to the fact that the brothers worked seven days a week. But, also playing a part in their success was the fact that the Glenn Pool oil field was discovered in 1905 and they found themselves in the center of one of the largest “booms” in American history. Success brought new locations and the furniture store finally found its permanent home at Fifth And Main in 1908, in a five story building the brothers erected. That building, which eventually was expanded to ten floors, was their first real estate venture in downtown Tulsa. The Mayo brothers real estate portfolio would continue to grow in downtown Tulsa and they became two of the city’s leading landlords. It was, however, their venture into the hotel business in 1925 that created an institution that was synonymous with Tulsa. The Mayo Hotel reflected the Mayo brothers exacting attention to detail. From the monograms on the flatware, to the careful nurturing of the hotel’s personnel, no detail escaped their critical eye. They created a symbol of quality and elegance that was embraced with pride by every resident Tulsa. The Mayo Hotel was the center of all activity in the city. Weddings, proms, charity balls, parties large and small, all were “special” if they took place at the Mayo. The hotel’s guests, which included every famous visitor to the city, carried the hotel’s reputation of sterling quality, and by extension the sterling quality of Tulsa, all around the world. While their personal attention to the hotel’s operations was the focus of their concentration, the Mayo brothers gave of their time and talents to help in the development of the city. Both were active in the Commercial Club, which became the Chamber of Commerce. In the days of the “stud horse note,” when private contributions funded the city’s infrastructure improvements, the Mayo name was on every list of donors. Cass was interested in streets and highway improvements and formed tasks forces to plan state-of-the-art expressways. John, who was called the “Grand Old Man of the Arkansas Basin,” worked with elected officials to develop what became the McClellan Kerr Navigation system. Both shared an interest in the airport and were among the largest donors when the Tulsa Municipal Airport was founded in 1928. Their philanthropy extended to every educational, cultural and medical institution in the city. Cass Mayo died in 1949. His brother, John, lived to the remarkable age of 91 and died in 1972. While their children admirably continued their fathers’ tradition of giving to Tulsa, the deaths of Cass and John Mayo were deeply felt by Tulsans. For most, it was impossible to conceive of a City of Tulsa that did not include its two most significant pioneers.